The Taveta Golden Weaver is a bird about 5.5 inches long is bright yellow overall with greenish yellow backs and tails. The yellow wings are tinged with rusty black bars. From other similar colored weaver birds, the back of its head and breast patches of light orange-red are its distinguishing features. These spots are a feature of the male, it is absent in the females. 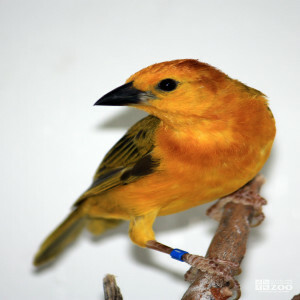 The range of the Taveta Golden Weaver is Kenya and Tanzania in East Africa. The Taveta Golden Weaver inhabits swamp vegetation and open acacia woodland. The Taveta Golden Weaver is a noisy and gregarious species. They may abruptly desert the breeding colony for no apparent reason, and return after an absence of weeks or months. The oval, unlined nest of the Taveta Golden Weaver is usually built over water, attached to two or more stems of reeds or grass. Nests have been recorded from March to May and August to November. Two or three eggs are produced, dark olive green and often with indistinct dark mottling.